Plastic Logic, the OTFT backplane developer and EPD producer has split into two companies. Plastic Logic will remain as an EPD developer and producer (based in Dresden, Germany) while FlexEnable (based in Cambridge, UK) will handle the OTFT backplane development and offer technology licenses to display makers. 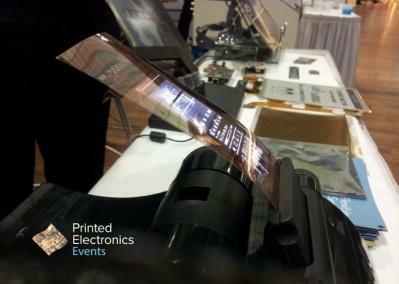 In 2014 Plastic Logic (in collaboration with Novaled) demonstrated a monochrome 4" 360x128 (95 PPI) flexible AMOLED prototype. This fully-organic AMOLED panel uses Plastic Logic's flexible OTFT backplane and the whole panel can be bent and rolled and still show the image. In February 2014 we posted an article explaining Plastic Logic's technology and their OLED plans for the future. In September 2014 Plastic Logic demonstrated the world's first display based on a graphene backplane (a 150-PPI active-matrix E Ink panel).